Today's choice was really difficult. I didn't take any great photos, but I didn't take any bad ones either. They were all good, but ... no more than that. 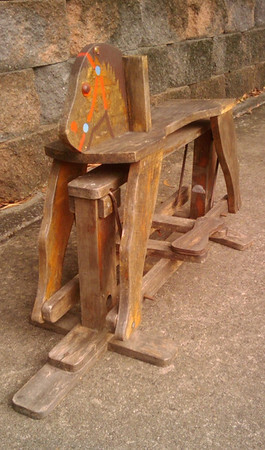 I ended up going with this rocking horse, found abandoned on the bikeway, because it is unusual subject matter (most of the rest were flowers, which, while pretty, are pretty standard). I cropped the photo a little, and I've also uploaded a desaturated version here. I'm not sure it worked well, as it's all the same approximate hue. Tonight's goal is to post today's photo before it's tomorrow.